Roasted Parsnip & Garlic Soup Recipe. After spending days cleaning the building dust off the downstairs of our house, then taking up a paintbrush and roller and turning our building site into a beautiful silver-grey room, I’m absolutely in need of nourishment and warm soup. I find making soup relaxes me, almost as much as creating risottos – must be all that gentle stirring as I gaze out of our window at the trees bowing their now leafless heads in the winds, and the little ‘mad’ birds, flitting from one side of our garden to another. So here comes another one to make for our lunch, courtesy of my favourite chef of the moment, Donna Hay. This Roasted Parsnip an Garlic Soup recipe contains quite a bit of garlic, roasted, and if you’re a bit wary of using too much, just tone it down by using less. It’s all about personal taste. But roasted garlic is less pungent and slightly sweeter than raw garlic, so see what you think. Looking at this picture, don’t you just want to eat it NOW! I do! Roasted Garlic & Garlic Soup Recipe. 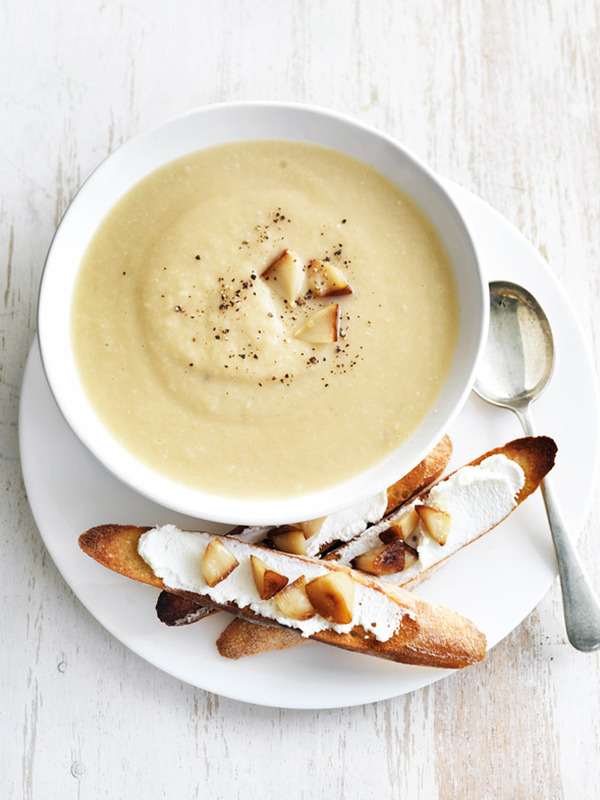 This Roasted Parsnip and Garlic Soup recipe is a great one for damp Autumn days. Tone down the garlic if you think it will be too much for you, or you're going out to a business meeting soon after. 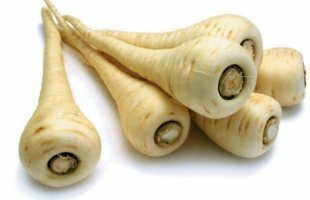 I find with such as parsnips, you can always add a teaspoon of curry powder or turmeric to give it 'kick' if you don't want too much garlic. But with the toasted bread, spread with goat's cheese, it makes a great lunch. I'm really looking forward to this one. Place the parsnip and onion and garlic on an oven tray, drizzle with the oil, sprinkle with salt and pepper and toss to coat. Cook for 20 minutes. Take out the softened garlic. Drizzle the parsnips and onions with the maple syrup and cook for a further 10 mins or until tender. Place the parsnips, onion and stock in a medium saucepan, squeeze the garlic from the skin of 2 of the bulbs and add to the saucepan. Using a hand-held stick blender, blend until smooth. Place over a high heat, stir through the sour cream and cook for about 2 mins. Squeeze the remaining garlic from its skin and stir half through the soup. Meanwhile toast the sourdough or crusty bread slices. Spread the sourdough with goats cheese and top with the remaining garlic. Serve with the warm soup. I reckon the Roasted Parsnip & Garlic Soup recipe is a perfect one for a damp, grey Autumn day. As I sit here at 6.00am in the morning, in my dressing gown, I can here the wind howling down the East Yorkshire coast, with the tall trees swaying almost drunkenly in the strong gusts. I imagine the fierce waves pounding the Hornsea beach, only 5 minutes walk away from our house, and I feel safe and warm and I smile. What a difference a year makes, and to me especially. But now I know that I will be around for a bit longer, I’m loving creating a new kitchen, and I’ve got a great family, especially my 5 fantastic grandchildren. What a lucky lady I am. And although this soup could be termed ‘comfort food’, today, for once, I’m not in need of comfort. But I really look forward to the soup. Hope you enjoy it. 17 Responses to Roasted Parsnip & Garlic Soup Recipe. I’ll be making this for Simon and his tennis coach. They’re always spent after a session. This’ll arouse them back to life. I’ll be getting jiggy with this recipe at the weekend. Now that the cold weather is here Ill be getting to grips with this dish. The wife loves her parsnips, and she trusts me with soups. Simply divine and a winner at Hesketh Grange. After a ride out on Saturday it was just what we needed. The stables boys enjoyed it too. Perfect for this weather. Mrs M loves it. Keep those winter warmers coming. It’s the soup season and we just can’t get enough. Do you have any sweet potato soup recipes this year. We also like the butternut squash soup. How’s the new kitchen coming on? I’ll try to drop in before we head off to Bangkok to our retreat. This is so easy to make and so tasty. I live garlic and parsnips so it’s perfect for me. I gave the housekeeper one earlier and she loved it. I don’t normally interfere with the help but I thought she must try it. Hi Feliccua, Glad you enjoyed the soup – We’ve had lots of compliments about it. Kitchens coming along fine – floor going to be layed this week. It’s looking good. Please pop in before you go on your retreat to Bangkok – bet you don’t get warming soups there. Have fun. I made this for our congregation. It went down very well. I can tell you that everyone was satisfied and warmed through in a cold day. Thank you so much Rev Flowers – What a lucky congregation you have. What about making them some of my Chocolate Fridge Cake recipe – goes brilliantly with a glass of Mulled Wine or Espresso coffee. Happy Christmas. Regards Astrid. i made this recipe yesterday, really great soup and i still have some left over for lunch today : ) One question – is it possible to add some spices to the soup and which spice could i use? Hi Chris – Glad you liked the parsnip and garlic soup. I like to play around with spices a lot, and would probably try turmeric or cumin or a mild curry mix. But my favourite at the moment is Ras al Hanou, the Lebanese or Persian spice. It has a bit of everything in it. See what you think. Regards, Astrid.